With pockets to stash your skins and a lycra stash hood, the Pierra Ment’ Jacket is perfect for skiing your secret stashes. Millet focused on abrasion resistance and breathability, choosing the Vueltex Knit fabric to get there. It’s a combination of nylon, polyester, and elastane that moves with you and won’t chafe. A bit thicker and warmer than the hoodie, the jacket is still light enough to race in (it is named after the most famous one). 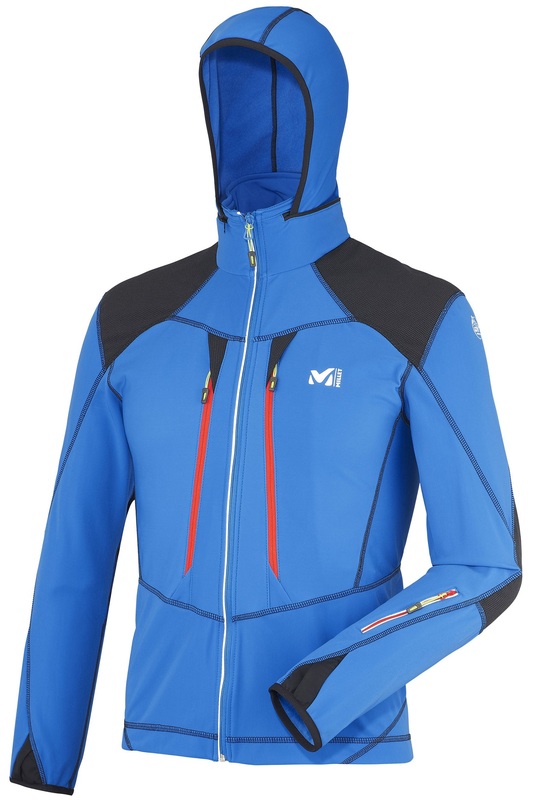 If you’re looking for a comfortable jacket for ski mountaineering, look no further. Two Direct Access™ chest pockets are perfect for stashing skins without taking off your pack. One Easy Access™ arm pocket is also oddly trademarked but holds things nonetheless. Lycra hood can be pulled out of the neck when the wind picks up on the ridges. Composit™ construction and flat-lock seams make for smooth motion. Elastic cuffs with a thumb hole and reflective piping finish the jacket and this list. I love this jacket so much I've bought two. It's an excellent outer layer for most conditions, and seems to get the balance of protection from the elements to breathability just right for skimo shenanigans. The pockets are simple and easy to use, and can fit surprisingly large skins. The hood is simple and effective. The back panel is awesome for venting. Fantastic jacket for ski touring! Btw, I'm 179cm, 75kg and use the large. For the Millet jackets; if I'm usually a large should i order an XL for Millet? Hi Scott, yeah that would be a good bet. These are Euro XL so L in what you're used to. This is an amazing all purpose layering piece. It's just the right weight for winter tours with a lightweight baselayer underneath. Fit is athletic; it's pretty snug. I'm 5'10", 135 lb. and the small is very form fitting. The hood gives very good coverage without being restrictive. And it zips up into the collar. The skin pockets are cut for race skins, but they also serve as vents. There is a zipper left arm pocket that would fit a smaller iPhone or gps. I choose this over the lighter weight model primarily for the shoulder reinforcement. It was a little warm at times but I never felt sweaty. If wearing during warmer spring temps I'll probably wear a silkweight wool t-shirt as the base layer.